So, on my personal Facebook page recently, I asked a question… “What is your most favorite kitchen gadget?” I got all kinds of answers from garlic presses, to Vitamix to wine openers! But the one that came up most often was an Instant Pot. So, if you don’t know what it is or want to learn more, here’s my two cents! An Instant Pot is a pressure-cooker. Pressure cooking is much faster, seals in moisture and flavor, and foods can be cooked directly from frozen. Three quart is considered the “mini” for dorms, RVs, and other smaller needs. Six quart is the standard size that easily feeds 4-6 people and can cook a meatloaf, cheesecake, or a small chicken or roast. Eight quart is for if you are cooking for a larger family. It takes a bit longer to come to pressure, but the extra size is handy. Healthy cooking is important to you. The Instant Pot makes wonderful healthy recipes, like bone broth. You are willing to invest a little bit of time in learning a new gadget. The Instant Pot is not difficult but there is a learning curve. You can’t just open the box, start throwing food in, and expect the perfect final product. When you begin, follow recipes and cooking times exactly. You have some money to invest in a high-quality product. The Instant Pot is not inexpensive, but you will find it well worth it. Watch for sales on Amazon.com. I have also seen them for sale at Walmart in their home section. I have always loved Crockpot cooking. The Instant Pot really is a step above a CrockPot. You can cook frozen meat in it and have a meal-ready and on the table in 30 minutes, if not sooner. 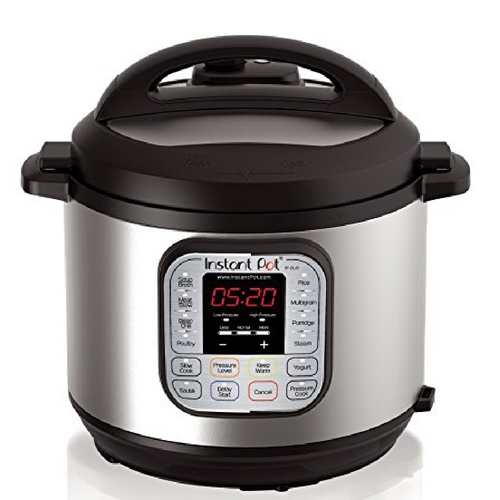 If speed is important to you, I highly recommend an InstaPot! I started cooking with an Instant Pot around January 2018. There is definitely a learning curve to it. I kept it in the original box for about a month, reluctant to open it and afraid to use it because of stories I had heard when growing up about how dangerous the old pressure cookers were. But, after beginning to use it with the recommended water test, I now use it at least twice a week. I love using it. There are recipes online that I use for delicious meals. You must work from a recipe because it is not intuitive as to how many minutes a recipe will need on the Pressure Cook setting. It makes delicious hard boiled eggs, artichokes, and chicken dishes. Cooking with an Instant Pot saves you time.